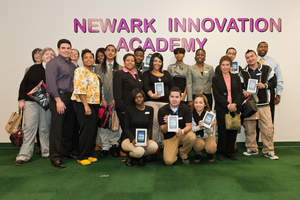 Verizon Wireless, provider of the largest and most reliable 3G network, as well as the fastest and most advanced 4G LTE network in America, is launching a new career development program with the Newark Innovation Academy (NIA) that will deploy wireless technology to the educational curricula of several high schools in the district. Most of the program will be facilitated on the Samsung Galaxy Tab™ using Edmodo's free Android App and online social learning network for education. A series of bi-weekly workshops will also be taught by Verizon Wireless employees, designed to inspire students to pursue higher education and assist them in career planning. "The choices we make in high school usually stick with us for life," said Stephen Peters, principal, Newark Innovation Academy. "We have a lot of bright students attending our schools and we would like to see them not only go to college but also succeed in their chosen professions. In this day and age, it is so important to be up-to-speed with technology and we are thrilled to have partnered with such great companies like Verizon Wireless, Samsung Mobile and Edmodo who are willing to bring their experience and resources to our classrooms." Earlier this month, the Newark Innovation Academy, with the help of Verizon Wireless, conducted a series of comprehensive interviews and selected 11 students to participate in the six-month program that will run through June. Verizon Wireless employees have volunteered to teach two-hour workshop sessions every other week that focus on how to successfully choose the right college and career path. The goal is to educate students about higher education options, financial aid and the importance of having a career path. "Verizon Wireless has always taken the concept of giving back to the community very seriously," said Fernando Molinar, Associate Director of Multicultural Marketing for Verizon Wireless, Northeast. "This technology-based education program allows us to expand our efforts in the community in a very effective and practical way through our award-winning wireless network and with the help of Samsung, as a valued partner." During the program, the participating students will also work on a team project that will focus on developing a strategic marketing plan for the Samsung Galaxy Tab. The project will help them develop real-life experience and provide key learnings about pricing, promotion and the importance of creating a positive customer experience. Samsung Mobile will provide a Galaxy Tab to each student and Verizon Wireless will provide free service for the duration of the program. The project will be performed using Edmodo's Android App and online social learning network which offers a secure place where educators and students can collaborate and share digital content such as documents, presentations, pictures and video. "We're excited to be partnering with Verizon Wireless for this important career development program, and we are very happy to provide Samsung Galaxy Tabs to all students participating," said Paul Golden, Chief Marketing Officer for Samsung. "Aside from being a premier mobile lifestyle and communication device, the Tab is also well-suited for educational purposes and gives us the opportunity to use our technology to help students succeed both in their education and livelihoods." At the end of the program, a panel of judges from Verizon Wireless will select the top three finalists of the six-month project and a public vote will determine first, second and third place winners. At the NIA Graduation Commencement Ceremony, Verizon will recognize the winners and contribute 20 tablets to the schools to build a Verizon Wireless Technology Lab which will continue to support the learning school curriculum. In addition, the company will sponsor the first-place winner with a $5,000 scholarship and a temporary employment opportunity at a Verizon Wireless store location. All winners will receive a Samsung Galaxy Tab for their efforts. Verizon Wireless operates the nation's most reliable and largest wireless voice and 3G data network, serving 94.1 million customers. Headquartered in Basking Ridge, N.J., with 79,000 employees nationwide, Verizon Wireless is a joint venture of Verizon Communications (NYSE, NASDAQ: VZ) and Vodafone (LSE, NASDAQ: VOD). For more information, visit www.verizonwireless.com. To preview and request broadcast-quality video footage and high-resolution stills of Verizon Wireless operations, log on to the Verizon Wireless Multimedia Library at www.verizonwireless.com/multimedia. Click here to visit our Verizon Wireless Northeast Tumblr page, and check us out on Twitter, http://twitter.com/VzW_NYMetro. With more than 1 million users and growing, Edmodo is the world's fastest growing social learning network, providing a free and secure social networking platform for teachers, students and school administrators. Edmodo offers schools a safe and easy way to connect and collaborate, offering a real-time platform to exchange ideas, share content, and access homework, grades and school notices. Accessible from any networked or mobile device via free smart phone applications, Edmodo is the social learning network made for teachers by teachers. Eleven students from Newark high schools were selected to participate in a 6 month career development program and competition sponsored by Verizon Wireless, Samsung and Edmodo at the Newark Innovation Academy.